However, the whole well-known historiography of the Middle Ages contradicts this assertion! The easiest way to understand doubts about the accepted chronology and ‘well-known’ history is to seriously systematize the problems of medieval research. This will lead us to detect a pattern which proves my thesis and gives reason to assume that a phantom period of approximately 300 years has been inserted between 600 AD to 900 AD, either by accident, by misinterpretation of documents or by deliberate falsification (Illig 1991). This period and all events that are supposed to have happened therein never existed. Buildings and artifacts ascribed to this period really belong to other periods. To prove this the Carolingian Chapel at Aachen will serve as the first example. Art historians explain and describe artifacts and buildings of this period as anachronistic – but they never follow up on their assessments. One of the best examples, intensively surveyed, is the Chapel of Aachen (ca. 800 AD), which seems to come approximately 200 years too early. The way of constructing an arch shown in this chapel has no predecessor (Adam 1968,7). Arched aisles are usual only in the 11th century in Speyer. The construction of choirs with rising arch and also rising barrel vaulting is not resumed until 200 years later at the portal of Tournus (Hubert 1969,67). The vertical steepness of the interior arches of the Aachen Chapel is more accentuated than those of churches built two centuries later. One of these is the 1049 AD consecrated Abbey-church of Ottmarsheim. Although missing some details of the early model, nevertheless it is the “best copy” of Aachen. However, these and many other arguments implicate that the Chapel of Aachen has to be regarded as a building of the second part of the 11th century. Another ‘big’ research-problem is the AD way of counting years. How could 300 phantom years have crept into the accepted chronology and why didn’t anyone notice it? For approximately 2000 years people have been counting years correctly, haven’t they? It seems, unbelievably, that Caesar introduced his calendar in 325 AD. This is unbelievable because by then he had already been dead for more than 300 years. If 16 centuries had passed since Caesar’s introduction of his calendar, the Julian calendar in Gregory’s time would have been out of sync with the astronomical situation by 13 days, not 10. Some historians have noticed this contradiction, but they solve it this way: the scholars in Caesar’s time reckoned a different date for the equinox (the day in spring, where day and night have the same length). Yet it can be proved that the Romans used the same date for the equinox as we do today, i.e. the 21st of March (Illig 1991 and 1993). If our thesis of 300 phantom years is right, then the thesis must also be valid for the whole of Eurasian-African history for the period between 600 AD and 900 AD. In this time period Byzantium and the new Islamic realms were supposedly fighting each other in the Near East and the Mediterranean. Let us look at Byzantium first. Historians acknowledge a special problem for exactly this period: when did the Empire reform its administration? When and how did this reform – called by modern historians ‘reform of the themes’ – come into being? How did feudalism develop? One group of historians pointed out that the essentials for this reform were outlined in Antiquity and that for the 300 years following 600 AD nothing happened. Thus nothing can be said about this period, because no historical sources exist for the supposed reform in this period. Another group interpolates between the years 600 AD and 900 AD a very slow evolution of Byzantine society. This evolution was so slow, they say, that the actors themselves hardly noticed it and thus this evolution didn’t produce any written document (no archaeological remains, either, by the way!). The discussion of both groups is termed the ‘debate of continuity’. The gap has to be filled by speculation. Therefore both groups accuse each other of misinterpreting historical sources in an anachronistic manner (Karayannopulos 1959,15; Niemitz 1994). Uwe Topper and Manfred Zeller pointed out how to resolve some important riddles and research problems of the Islamic and Persian-Arab-Byzantine world using the thesis of the phantom years. Firdowsis’ well-known epic, the Shahname, written around 1010 AD, ends with the last Persian king Yazdegird III, who died 651 AD. The epic tells nothing about the Islamic conquest of Persia and has no allusions to Islam at all. It simply skips 300 years of Islamic influence as if they had never existed (Topper 1994). Moreover, the Parsees – the Zarathustra worshipers – in India have been debating their own chronology furiously since messengers from Iran in the 18th century told them that they made a mistake in counting the years since their flight from the homeland [this claim/evidence, however, has been withdrawn in (Topper 1999)]. Even modern encyclopedias vary in their assertions between the 7th and 10th century for the event (Topper 1994). A thorough examination of the architecture of the Omayyades – they were the famous first Arabic dynasty from 661 AD until 750 AD – detects untypical characteristics for an Islamic dynasty. These unusual characteristics are especially visible in their palaces. We see a painting (approximately 725 AD) on a wall (in spite of the Islamic prohibition against portraying human figures!) showing the Persian king Khosrow II, paying homage to the Omayyade sovereign. But by then this Persian king had been dead for approximately 100 years. The introduction of Arabic coins organized by the caliph Abd al Malik in 695 AD reveals some remarkable contradictions. The Arabic coins bear the portrait of the Persian king Khosrow II who died long time before (Zeller 1993). Manfred Zeller draws the following conclusion from this and other facts: We have to eliminate two phantom times; the first of approximately 78 years (from 583 AD until 661 AD) and a second one of approximately 218 years (from 750 until 968). The first phantom time came into being through artificial separation of the Persian and Omayyade history which in reality was contemporaneous. Thus Zeller explains the contradictions of the un-Islamic style and the late appearance of Khosrow II in the Omayyade history. The second phantom time is a time-stretching repetition of the Persian history from 528 AD until 661 – now in Islamic style and dated from 750 until 968. Harun al-Rashid is an invention, as is the whole history of his dynasty (Müller 1992). Probably Islam did not spread until 10 centuries ago. While this way some riddles and research problem can be solved, others will follow. For instance the miraculous origin of Islam. It is generally known that historians are astonished by this ‘miracle’; we can read this in the introduction of Fischer Weltgeschichte, Volume I, Der Islam I: “Birth and success of Islam seem to be a miracle.” (Cahen 1968,7). A miracle (“Wunder”) like that is needed for an explanation – this is known to all scientists. Gunter Lüling has suggested a new scenario (Lüling 1974 and 1981). “It seemed, that they (the Jews) totally disappeared together with the breakdown of the Roman Empire. However, we don’t find any evidence of their presence until the Carolingian period.” (Roth 1966,162). “Of course we know from inscriptions and other sources about Jewish societies and single persons in nearly all provinces of the Roman Empire, and we can reasonably suppose – with or without proof – that there is in fact no district without Jews. Nevertheless there doesn’t exist any evidence and only little probability that a substantial number of Jews lived anywhere in the western world at this time.” (Roth 1966,4; Illig 1991). Fig. 1: The center of the graph shows the time axis of con­ven­tio­nal­ly dated historical events. Upper and lower coordinates show re­con­struc­ted time tables. The black triangles mark the phantom years. How can we find support in archaeological research for our phantom time? In 1986 a conference of archaeologists specializing in medieval towns took place under the heading: “The rebirth of towns in the west, AD 700–1050”. The participants discussed a puzzling problem: does continuity in the evolution of the town – postulated by historians – exist or not? The archaeologists could prove that the stratigraphies of towns – adapted to ‘normal’ chronology – inevitably involve gaps. Where was continuity? Generally it is enigmatic to archaeologists if towns in the early Middle Ages had had an economic sense or function. Historians and archaeologists must maintain that no civil town building existed in this period and that only church buildings survived from that time. To justify this they must assert that at that time towns were not central marketplaces (Hodges 1982,49; Niemitz 1992). The few existing stratigraphies of German towns give evidence of the phantom time. In Frankfurt am Main archaeological excavations did not find any layer for the period between 650 and 910 AD. Nevertheless it has been assumed that something had been found in order to avoid empty centuries, which is unconceivable. Thus the absent period was construed by layers – composed of waste and ceramic fragments from other locations – which were spread to fill in the gap and support known chronology (Stamm 1962; Niemitz 1993). Archaeological research in ceramics encounters big problems for the projected phantom time. Two quotations: “The evolution of half a century is unclear” writes Peter Vychitil in his 1991 publication about ceramics of the 8th to 13th centuries from settlements of the Main-triangle. Thirty years earlier Werner Haarnagel had some troubles with the slow-moving evolution of vessel forms in the 7th, 8th and 9th centuries at the North Sea coast; it is impossible to find an order in these ceramic vessels. Even to construct a relative chronology still seems to be impossible. Therefore the ceramic experts try to solve their problems with mathematical and statistical methods (Vychitil 1991,21; Niemitz 1994). “Independent of the existence of written sources for that period, the medieval archaeologist should try to date his finds with archaeological means. It is not permitted to act in a different way than an archaeologist of ancient history.” (Fehring 1992,48). “But we do miss a reliable milestone of this kind like the one provided by the burial hoard of Doornick (Childerich I). The boundary leads into uncertainty, sometimes until the 9th and even 11th centuries.” (Lindenschmit 1880,75). This shows that each specialist refers to the neighboring discipline to solve his problems of dating – a typical case of circular reasoning. Nobody looks over the whole situation and therefore nobody is astonished that the same structural problems occur in different disciplines. “We use the C14-method only to correlate a sample of carbon with a certain tree ring. This method – at least for the post-glacial period – has become a relative method.” (Willkomm 1988,176). Dendrochronology works, because each time period creates typical sequences of tree rings. With the help of overlapping sequences of different trees it is possible to construct a standard sequence that reaches back centuries for a given region. In this standard sequence you can find for any suitable wood the corresponding age of growth of this tree. This seems to be a very simple theory; you have to count the tree rings if you want to find the exact year, that’s all. “Transformation of the ring-width into logarithmic differences, preferential treatment of the correlating arithmetic, theoretical derivation of congruent patterns, distance regression of similarity, regional analysis, test function with scope of dating, statistics of sapwood and lost tree rings, distribution of centered differences between dating of art styles and dendrochronological dating.” (Hollstein 1980,11; Illig 1993). Using this method one easily commits errors. The following demonstrates this: researchers erroneously construed the interval between 2000 BC and 500 AD by synchronizing North and Central European oak wood. In one of the synchronizations the error amounted to 71 years. Not only these 71 years are alarming but also the error by itself. Methodically the error was duly kept at 71 years because otherwise the wood – dated before with other methods – would not fit historically. But how was it possible to locate those 71 years in the standard sequence? Are the mathematical methods so flexible? Distrust is necessary even more so because the author of that publication emphasizes that in this case of dating some unfavorable circumstances accumulated and such might happen in every (sic!) laboratory (Schmidt 1984, 233). There is another argument against applying dendrochronology to the Middle Ages. The number of suitable samples of wood, which connect Antiquity and the Middle Ages is very small. But only a great number of samples would give certainty against error. For the period about 380 AD we have only 3, for the period about 720 AD only 4 suitable samples of wood (Hollstein 1980,11); usually 50 samples serve for dating. Fig 2: Number of samples in time (Central European oak chronology). “The method is unbiased and basically not graphic, because it combines many calculation operations, and you have to do the more operations, the more the problem of dating is distant from today and from comparable historically secured dates. At border-line when totally leaving known history – e.g. analyzing two completely unknown samples of trees which grew supposedly at the same time – the a priori probability of finding the right date can become so small that only a little chance remains of finding it. For trees of the post-glacial the probability is approximately one in 10000. 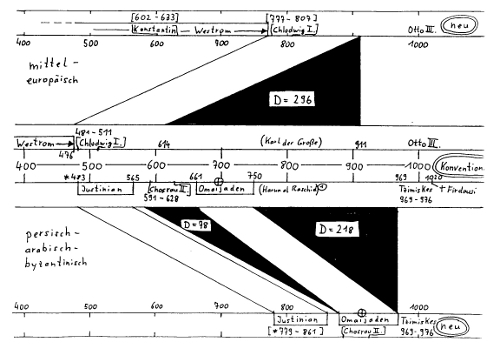 These hints show clearly the biggest difficulty of the dendrochronological method.” (Hollstein 1970,147). “All attempts to get enough tree ring sequences from timber of the Carolingian times have failed …” – “It is strange, but it proved as extremely difficult to connect the Merovingian wood samples from excavations with the above mentioned chronologies.” “Encouraged by an unusually deceptive correlation – as happens from time to time in all fields of knowledge – I believed that I could date the chamber burial of Hufingen at the beginning of the 8th century.” – “After two years of intensive studies I can name at last the right dates and put in order all samples of the early Middle Ages.” (Hollstein 1970,148). “The misdating of coffins from Hüfingen and Oberflacht, which had been calculated very carefully in accordance with the then valid rules (sic! ), suddenly proved that the statistical methods must be tightened up the more the event is distant from the starting point. That has been neglected hitherto – but is now corrected. Now we don’t choose arbitrarily a so-called error-probability at the outset, as has been usual. Now we choose the probability of the correct approach as a function of the observations and available hypotheses. The quality of this test method is, if circumstances permit it, one hundred times better and also more certain than the old one.” (Hollstein 1970,148f). Here we can observe the way Hollstein changes the method, which reveals even more, i.e. the expectations of waiting colleagues; and those expectations weren’t purely academic as he had to beg for money for his research. “As I have been asked time and again to publish my new dates, I feel obliged to give them in a preliminary way and without proof, be it in contradiction with scientific tradition. … From this chronologically arranged summary, one cannot deduce after how many futile tests the right correlation has been found. And it still remains a process of searching, which is not altered by the fact that we use computers.” (Hollstein 1970,149). Hollstein reports about bridging the critical period of the 8th century; there simply exist no samples of wood. “In this moment Dr. R. Gensen discovered on the Christenberg near Marburg/Lahn a well from Carolingian times, whose heavy squared timbers provided a sequence of 339 years. Although this is wood of red-beech, a type of wood with occasional tendency to missing rings, still this Marburg sequence coincides in the decisive period of the 7th, 8th and 9th centuries … with the other sequences … So early medieval wood samples cannot be regarded as firmly dated.” (Hollstein 1970,150f). In brief, Hollstein says that he – being in trouble – took a piece of wood predated by historians to fill his gap (see Fehring above). This cannot be called archaeological evidence. “It is good to know that the West German oak chronology for nearly one thousand years is exactly under control – year by year. 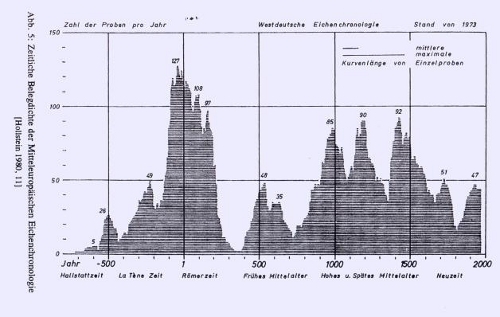 Going back to earlier millenia, the missing documentary frame has to be substituted by an essentially tightened correlation.” (Hollstein 1970,152). We could express this statement thus: It is very difficult to point out the years before 1000 AD because we do not have any dates supported by written documents. Why not quote more recent test results (after 1980)? A Hamburg dendrochronologist responded to my request for recent literature in December, 1994: today sequences and dates are no longer published because there exists the danger of abuse. Hobby-dendrochronologists earned money by dating for example timbers of houses for private clients with unreliable methods. So laboratories in Europe and worldwide exchange their dates without publishing them (Niemitz 1995 – in preparation). After a cursory glance over the riddles and research problems two great questions remain: “How was it possible to insert this phantom time into history?” – or asked in a provocative manner – “Who (and when and how and why) falsified history by adding 300 years?” And the second question: How can it be possible to discuss the thesis of the phantom time in the scientific community without being discriminated against as some ‘Von Däniken of the Middle Ages’. Both questions are more closely connected than you might assume at first thought. One could try to find the answer to the first question in postulating a theory of conspiracy (the Freemasons, the Catholic Church or one of the Catholic monk orders such as the Benedictines or the Jesuits – or any other secret association). But this – I suppose – will deter scientists. And this answer is not only far too simple, it is essentially wrong. The second question – the question of the scientific community – could be put this way: why did the ‘stupid’ scientist and researcher not notice this gap before? Why did some outsider have to come and ask this question and start finding the solution? The second question implicitly triggers the threat of changing of the paradigms, which implies a threat to confidence in the work of all scientists working in historical research. Thomas S. Kuhn discusses this situation regarding science in his book “The Structure of Scientific Revolutions”. But in our case something new appears: For the historical period and especially the Middle Ages no paradigms have ever been challenged. This may sound pathetic or megalomaniacal; and accusations of this kind will come from specialists, who have to reckon with enormous shiftings and new structures in their field. But nevertheless this question can only find an answer through discussions within academic circles if it is to be answered at all. Let us go through some of the questions in detail. First question: Why do we suppose that three centuries have been faked in medieval history? Our discovery began when we accidentally learned about the problem of faked documents in the Middle Ages. Incidentally the German “Monumenta Germaniae Historica” had just published the papers of its conference “Fälschungen im Mittelalter” (München, September 16th to 19th, 1986) (Niemitz 1991). “‘Falsifications in the Middle Ages’ – are really no minor subject for medievalists. In this conference we treat the central problem of historical-scientific research, the ‘discrimen veri ac falsi’, i.e. the question for authenticity of the documents and even more – the concept of truth in an important period of history of mankind.” (Maier 1988,63). The important question of the medievalist is: How was history made? Because he knows how false history can be made. We were really impressed by one of the lectures – a lecture about the great number of fakes and suspicious documents. It was at the end of the conference when Horst Fuhrmann, president of the Monumenta Germaniae Historica, emphasized a special peculiarity of some of the important faked documents. He demonstrated that the important fakes of the Roman Catholic Church have an anticipating character (Fuhrmann 1988,89). These documents had to wait their great moment to come. “Centuries after being produced these fakes were integrated into the framework of the clerical and laical world .” (Fuhrmann 1988,90). Fuhrmann’s opinion was that in the first place the environment (“Umfeld”) must exist before a fake can be effective. “It is naive positivism to argue, that fakes like the ones represented here could have changed the world. An assertion like this confuses cause and effect: rather a correspondingly changed world had accepted the fakes. Or in other words: The evolving Papal centralism didn’t need the fakes; but the fakes needed the evolution of Papal centralism in order to become successful.” (Fuhrmann 1988,91). But why then did the church falsify documents, when they were unnecessary? Yet this was not what aroused our astonishment although this statement, even born from need to solve a riddle, is a ridiculous explanation. We were shown fakes from preceding centuries. We divined chronological distortions. Therefore we inspected the calendar calculation mentioned above with the result of a time error amounting to three centuries. Then we looked for ‘gaps’ in special reports and publications, also for periods of stagnation or strange events repeated in similar manner after approximately 300 years. I only refer to some of a great number of puzzles: a gap in the history of building in Constantinople (558 AD – 908 AD); a gap in the doctrine of faith, especially the gap in the evolution of theory and meaning of purgatory (600 AD until ca. 1100, Le Goff 1990); a 300-year-long reluctant introduction of farming techniques (three-acre-system, horse with cummet) and of war techniques (stirrup) (White 1968, 66); a gap in the mosaic art (565 AD – 1018 AD); a repeated beginning of the German orthography etc. etc. (Illig 1991; Niemitz 1991; Zeller 1991). The puzzles of historiography led the way, pointing out again and again the ‘gap’ which we soon termed ‘phantom time’. But who could have had an interest in faking so many documents? And why did the ‘fakers’ need a phantom time of 300 years? We developed two hypothesis which basically don’t contradict. Hypothesis One: Otto III didn’t live accidentally around the year 1000 AD; he himself had defined this date! He wanted to reign in this year, because this suited his understanding of Christian milleniarism. He defined this date with the help of his famous and well-versed friend Gerbert de Aurillac, later Pope Sylvester II. In reality they lived approximately seven hundred years after the birth of Jesus Christ, but never until then had the years been reckoned ‘after Christ’. Perhaps unaware of their error and without intending to falsify they defined one special year as ‘1000 AD’ (Illig 1991). Consequently chroniclers had to invent 300 years of history. To fill up empty periods – what a great occasion for dynasties and kings! You can design the planned future as a construct of the past, and this apparently happened: Otto III construed Charlemagne as the model hero he himself wanted to be. Supposedly he sketched Charlemagne’s history only a bit, or it wasn’t even him but the generations after him who lined out a whole full life picture. Especially the clergy hoped to get advantage in its confrontation with the emperor, which had started in the 11th century. Hypothesis Two: Constantine VII of Byzantium (905 – 959 AD) organized a complete rewriting of the whole Byzantine history. The famous German Byzantinist Peter Schreiner has demonstrated how official historiography interprets this process: beginning in the year 835 AD monks rewrote piece by piece all texts which had been written in Greek maiuscula, in the new form of writing hence called minuscula. Schreiner postulates that each text was produced only once. Then the originals were destroyed (Schreiner 1991,13). This means that all existing texts of the then leading culture nation had been changed or rewritten completely in new script in the lifetime of two generations, or even faster, and have been well invented, we suppose (Illig 1992). It is not important to explain the motivation of the emperor Constantine VII. I only want to demonstrate, that an action of rewriting and faking like this has happened. If it could happen in Byzantium, it might have happened at any other place, too. Moreover Theophanu, mother of Otto III, came from Byzantium and was a niece of the emperor Tzismiskes (emperor from 969 AD until 976 AD), a descendant of the same dynasty as Constantine VII. As to the question of who faked and why, there could be many speculations. Its seems that in this question surprises are ahead which could create trouble for many academic institutions as well as other social groups. Second Question: How is it possible to do research work of this kind inside the scientific community? Is it perhaps necessary to research outside the scientific community, because it would demand a big change of paradigms, which means the end of certainty with regard to chronology. Usually a program of research relies on given research problems, which the general public defines. What will happen when the new research program in regard with its thesis or approach is too far from general public interest or too far from the academic society? (Who shall give financial support?) Then we don’t have the capability of joining ‘normal science’. I am aware of standing on the shoulders of our predecessors and that we work using their results, I can only emphasize again and again my respect for archaeologists and other scientists who are able to uncover artifacts and construct theories on them. “It is only through activities in the margin of scientific institutions that outsiders can amplify the disturbances, so that instabilities will appear, which in the end will restructure existing research.” (Krohn, Küppers 1989,95). “As the unity of the scientific performance is a solved problem and as the group knows well which problems are already solved, only few scientists would be willing to take up a standpoint that reopens research on many already solved problems.” (Kuhn 1970). Our thesis produces new problems and questions – especially seemingly solved ones. But it promises to solve more problems than ever before in the historiography of the early Middle Ages. What can I request from the historian, the archaeologist of the Middle Ages, the philologist and the philosopher? What would I do in their place? Important is the need for discussion and sponsorship. There exist two attitudes toward research: One of them is direct professional approach (history, archaeology, and philology); the other is discussing the theory of knowledge and science. Obviously our project is one of interdisciplinary research. Only in this way we can produce the expected change of paradigms with the necessary emotional distance. The following literature is only a fraction of what should have been named. Various essays by Illig, Müller, Niemitz, Zeller and Topper directly related to the phantom time hypothesis are listed separately later. Illig, Heribert; Niemitz, Hans-Ulrich (1/91): Hat das dunkle Mittelalter nie existiert? Illig, Heribert (3–4/91): Väter einen neuen Zeitrechnung: Otto III. und Silvester II. Illig, Heribert (2/92): Wann lebte Mohammed? Niemitz, Hans-Ulrich (3/92): Archäologie und Kontinuität. Gab es Städte zwischen Spätantike und Mittelalter? Müller, Angelika (4–5/92): Karl der Große und Harun al-Raschid. Kulturaustausch zwischen zwei großen Herrschern? Topper, Uwe (2/96): Wer hat eigentlich die Germanen erfunden? Like Mojtaba Ghafouri likes this post.